Item description: Letter, dated 18 December 1863, from James J. Iredell to William S. Pettigrew. 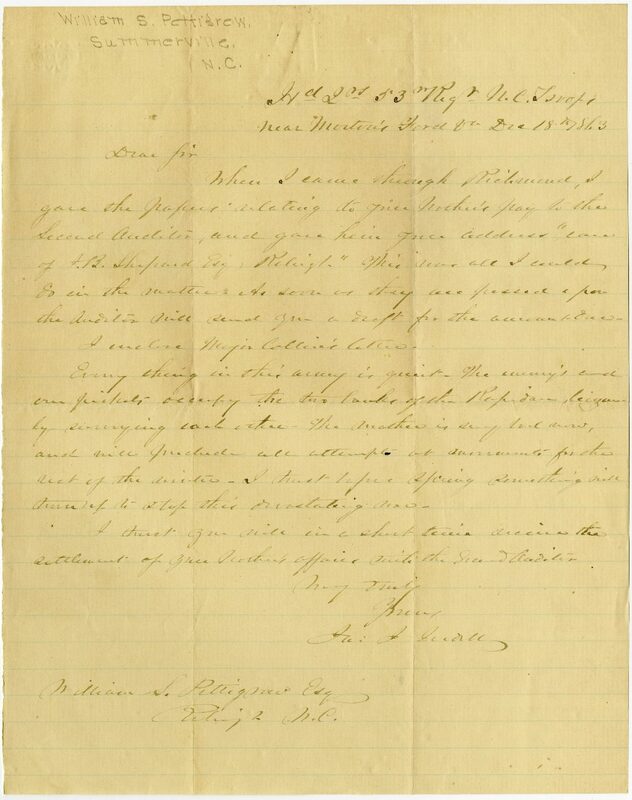 The letter discusses arrangements relating to the financial accounts of Pettigrew’s late brother, James Johnston Pettigrew, specifically his pay from the Confederate army, and conditions of troops on the Rapidan River in Virginia. Item citation: From folder 266 of the Pettigrew Family Papers #592, Southern Historical Collection, Wilson Library, University of North Carolina at Chapel Hill. When I came through Richmond, I gave the papers relating to your brother’s pay to the Second Auditor, and gave him your address “care of J. B. Shepard Esq. in Raleigh.” This was all I could do in the matter. As soon as they are passed upon the Auditor will send you a draft for the [accumulation?]. I enclose Major Collin’s letter. Every thing in this army is quiet. The army’s and our pickets occupy the two banks of the Rapidan [Region?] by surveying each other. The weather is very bad now, and will preclude all attempts at movements for the rest of the winter. I trust before Spring something will turn up to stop this devastating [snow?]. I trust you will in a short time receive the settlement of your brother’s affairs [with?] the Second Auditor. More about this item: James J. Iredell was the son of James Iredell Jr. (Governor of North Carolina from 1827-1828) and grandson of James Iredell Sr. (one of the first Justices of the U. S. Supreme Court). James Iredell Jr. and Ebenezer Pettigrew, William S. Pettigrew’s father, attended Edenton Academy together from 1802 to 1804. James J. Iredell would be killed in action on May 10th, 1864. This entry was posted in Southern Historical Collection and tagged death, James Johnston Pettigrew, legal matters, troop movements, weather, William S. Pettigrew. Bookmark the permalink.